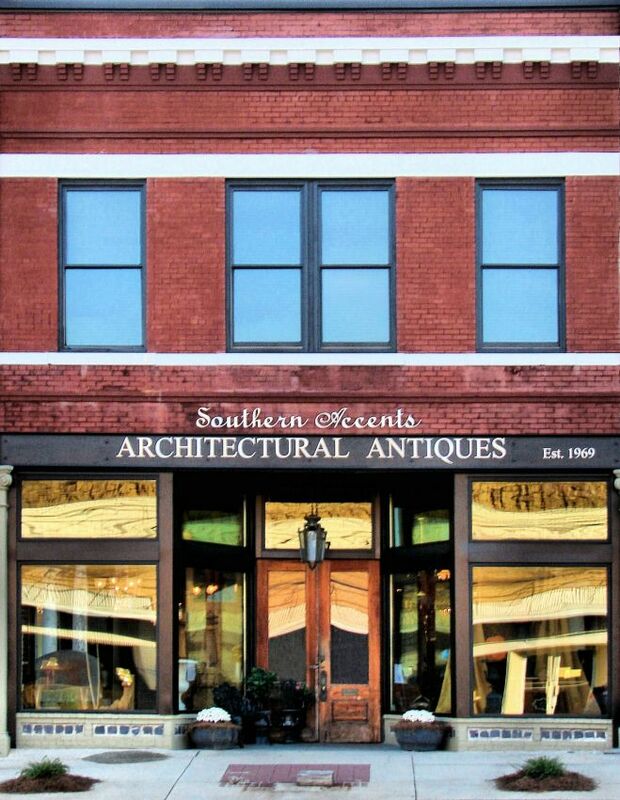 Southern Accents Architectural Antiques is located in Cullman, Alabama. Our mission is to promote the preservation of our architectural heritage through rescuing, restoring, and protecting artifacts of historical significance. We house the largest collection of architectural antiques in the Southeast. Visit our showroom and you will find stunning mantels, beautiful antique doors that range from ornate to simple, antique lighting including exquisite crystal chandeliers, salvaged windows, stained glass, newel posts and columns and so much more! Behind our showroom you can browse our warehouse full of mantels, doors, windows, and trim. Located on the same block is our iron lot full of antique iron, claw foot tubs and pedestal sinks. Just down from the iron lot is our garden lot stocked with urns, benches, fountains, stonework and more! Travel 1 mile down the road and you will arrive at our salvaged wood warehouse! This former basketball gym is home to our huge selection of salvaged wood and trim. Southern Accents began in 1969 when Dr. Garlan Gudger began rescuing architectural objects from buildings slated to be demolished in his local Community of Cullman, Alabama. Not realizing his hidden desire of antique building materials would flourish into one of the largest stores in the nation, Dr. Gudger consistently did what he enjoyed – rescuing and restoring architectural salvage. Being ahead of his time, he knew the demand for his recycled material would not balance with the supply he was obtaining, so he started organizing the salvage into his 2 car garage. It didn’t take long for word to spread of this “Garage Collection” and the quality of antiques that were showcased. Over time, he realized the interest of this industry was gaining momentum and a small shop was opened in North Cullman. His love for antiques and years of hard work paid off as he began collecting notoriety for owning the premiere architectural salvage store in Alabama. The business continued to grow and eventually moved to it’s current location. February saw Southern Accents traveling to New York City where they collaborated with fashion designer Billy Reid, designing and building his set for Fashion Week 2013. Returning from New York, they quickly switched gears and set up shop at both the Birmingham Home and Garden Show followed by the Huntsville Building, Home and Remodeling Show. The month of May saw Southern Accents heavily involved in Southern Makers. A highly-curated, one day festival celebrating the creative heritage that is Alabama. Southern Accents designed and constructed five unique areas, setting the stage for the sold out festival: the entrance, stage, work shop area, inspiration chalkboard, and a “collage” dumpster wall. You can visit Southern Accents online at www.sa1969.com. Their showroom and warehouses are open Tuesday – Friday from 9:00 am to 5:00 pm and Saturday from 10:00 am to 4:00 pm. Give them a call at 877 737-0554 during regular business hours and speak with one of the sales representatives who are always ready and willing to help you find exactly what you are looking for!